Industrial Light & Magic was honored with the inaugural Visionary Vanguard Award at the 27th annual PGA Awards ceremony on January 23, 2016. The award recognizes ILM’s groundbreaking work in visual effects and innovations that have revolutionized storytelling. Previously, the Visionary Award and Vanguard Award were presented to separate recipients. 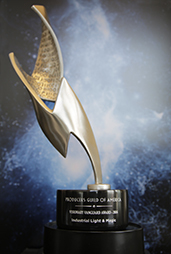 In 2016, the PGA noted because of the unique nature of ILM’s contributions to technology and entertainment, the Guild had combined the two awards into a single honor.